Beyond understanding reports, much can be learned from analysis of the information and interpretation of what it is telling you. This tool provides the description and calculation of 14 ratios, including a mix of balance sheet and income statement ratios. Once familiar with these ratios, you can use the Ratio Calculation Worksheet to get started. 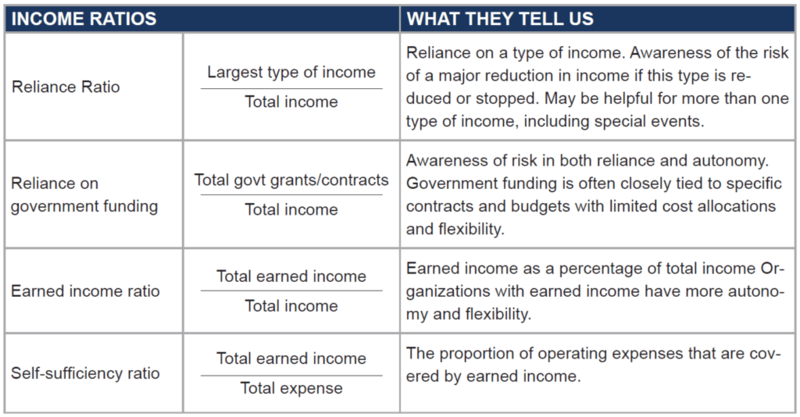 Nonprofit leaders seeking to understand their organization’s financial situation usually start by reviewing the financial reports. Understanding the financial information is the building block of any financial discussion. Beyond understanding the reports, much can be learned from analysis of the information and interpretation of what it is telling you. The basic analysis includes comparing financial reports to a benchmark such as the budget or the financial report from the previous year. One essential question is: does this information match our expectations? For a more technical financial analysis, ratios can be used to deepen understanding and interpretation. 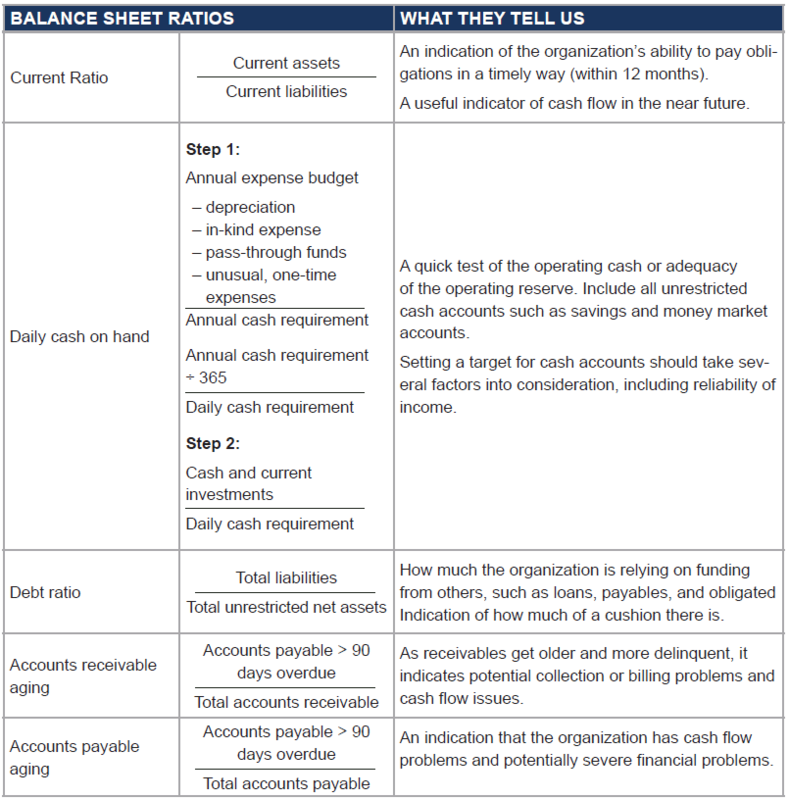 Financial ratios are an established tool for businesses and nonprofits. 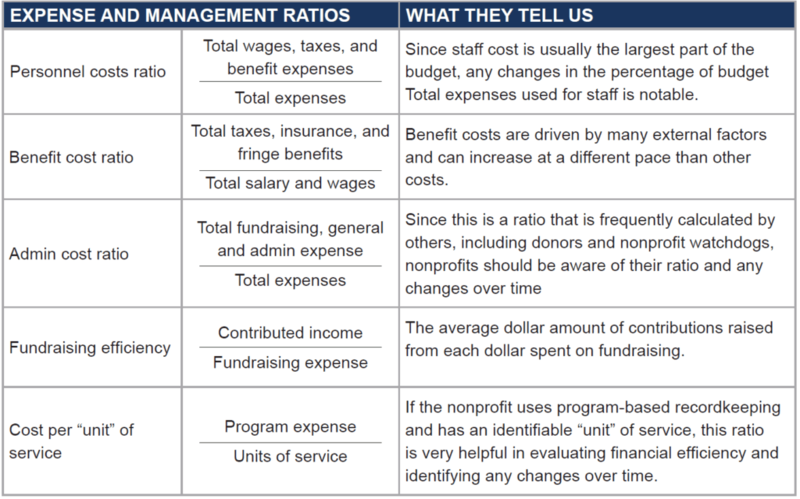 While there are dozens of ratios that can be calculated, most nonprofits can use a handful of them to learn more about their financial condition. This document provides a description and calculation of fourteen ratios, including a mix of income statement and balance sheet ratios. Individual nonprofits must decide for themselves which calculations are valuable. When calculating ratios from the balance sheet, be aware of temporarily or permanently restricted funds and how they might affect the ratios. Calculate the ratios using only unrestricted assets to yield the most useful results. A spreadsheet with these calculations is available to download from our website here.